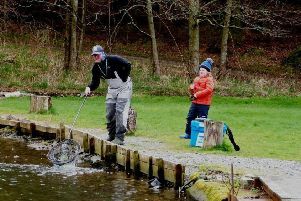 Fish are less active and any feeding fish are to be caught at lower levels with lures being the preferred tackle at Delgatie Castle Trout Fishery. K. Fraser, Greeness (21 fish, various lures, bibio, buzzer); A. Murray, Gardenstown (21 fish, white nomad, pink/white fritz); A. Cowie, Fraserburgh (20 fish, WSW cat;’s whisker, black nomad); R. Ewen, Macduff (12 fish, buzzers); L. Davidson, Macduff (12 fish, olive cat’s whisker); C. Field, Fraserburgh (11 fish, white nomad); P. Cowie, Fraserburgh (10 fish, silver lure); G. Littler, Newmachar (10 fish, black buzzer); N. Thomson, Turriff (9 fish, buzzers); J. Mackay, Macduff (7 fish, WSW, blobs); S. MacLean, Fraserburgh (7 fish, olive fritz); P. Wilson, Aberdeen (7 fish, (WSW, blobs). Delgatie Castle Trout Fishery is open seven days a week from 8am til 9.30pm throughout month of June.